Opening today 13th July 2018, Feast Your Eyes returns to London this time in Notting Hill, 58-60 Notting Hill Gate, London W11 3HT. The pop-up art exhibition showcases original artwork from five leading Southern African artists – Asanda Kupa, Audrey Anderson, Diana Hyslop, Emma Willemse and Sebastian Borckenhagen – taking over an empty restaurant space. Running 13 – 15 July. Nando’s has the world’s largest collection of contemporary South African art hanging on its walls. Alt Africa Editor’s was down at the press launch where Touria El Glaoui, Founding Director of 1-54 hosted a talk with Asanda, Sebastian and Diana three of the 5 artist whose work is featured in the exhibition, Alt A caught with the artists who shared what inspires their works. There is an opportunity to buy at the exhibition, with prices starting as low as £20 making art obtainable to most. Asanda Kupa: Since the infamous Marikana massacre of 2012, the work of Asanda Kupa (b.1981) has centred on the subject of mass protest and social movements in South Africa – a microcosm of the experiences of those on the margins. Highly emotive, his crowd scenes are moody and murky, bristling with energy and urgency, set against a deep and enduring longing for the land. They convey the rage of injustice but also the spirit of self-determination, the act of frustration but also of hope. As Kupa explains, he “…seeks to revive or vitalise the spirit of independent motion and energy within these subjects”. His expressive abstraction of the human form intensifies this energy and highlights questions around crowd psychology – of anonymity, unity and the tension between group and individual identity. 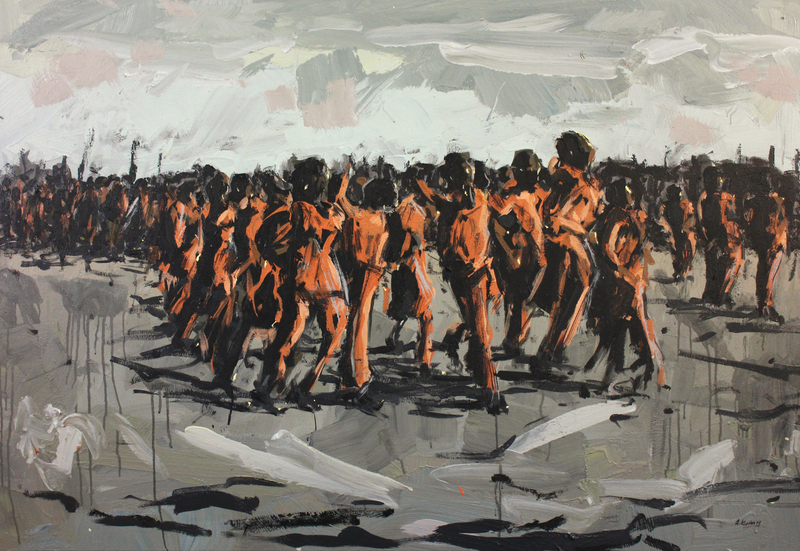 Main image: Asanda Kupa Prisoned destinies, or…_ 1360x940mm _ Acrylic on canvas. Diana Hyslop (b. 1949) describes her art practice as magic realism, an apt term for work that combines a range of objects from realities both commonplace and fantastical; in the depiction of the vast and nuanced range of whimsy and fear, conscious and unconscious, that is the quirky yet everyday human condition. Working intuitively in vibrant, luminous oil paint – a medium that allows for working and reworking until the balance between “real” and “imaginary” is just right, Hyslop juxtaposes images to create new meanings, drawing from a library of personal, playful, mythically-charged symbols. Her human, animal and hybrid figures “seem to float in the half rooted, half-etheric realm of dreaming”, suspended against abstract colour fields – ambiguous spaces dislocated from any discernible context. Sebastian Borckenhagen has covered diverse creative ground that includes comics, animation, drawing, painting and collages, self-publishing more than 30 zines in parallel. His is a world of connections between people and imagery that expands with each new exploration of medium, each creative improvisation. It is terrain cultivated by a love of experimentation, an intuitive and playful approach and an almost maverick ability to change tack when the process requires it. Borckenhagen began his creative career drawing comics. But it was after some major life events, as well as participation in an underground comics festival in Rome, that he made significant shifts in his approach – dabbling in the notion of abstract comics, and changing his perspective on drawing as an exciting physical process rather than merely a tool. Borckenhagen told about “An Education from Above.… “I find the whole inspiration thing quite difficult to talk about, the way I think about it as improvisational, I spend a lot of time developing my work so I can move around in it. It is very much about what is going on , where I am in life, if I try to directly bring ideas into, like this is what I am inspired by recently, is just gets lost. I do the painting then I name them afterwards, naming is the last layer of the artwork itself. The name came from a few things, I resent this idea of certain knowledge being privileged to others, and an authoritative thing, kind of military and a take on authority and no way linked to, but resonating with spirituality, I don’t mean any religious idea but divine something, intuition”. Read more of the interviews in the next issue of Alt A Review the new Arts Paper.